Hi there friends! 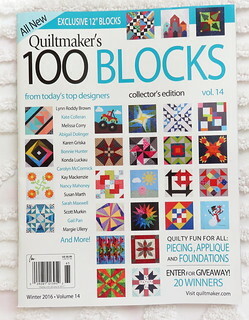 The latest Quiltmaker's 100 Blocks magazine is out again! This is Vol. 14, can you believe it? As usual the magazine is chock full of great blocks by a lot of your favorite designers, including me! This is my 14th block for the magazine I'm excited to say. Here's my block, Summer Impatiens. It's a combo of fusible applique and basic piecing. 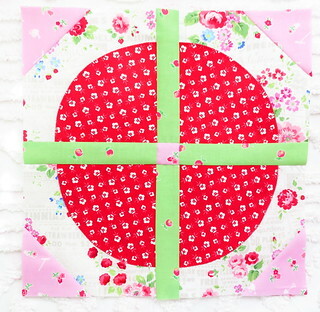 Like a lot of the blocks I've done for Quiltmaker, it's floral inspired. I appreciate a chance to participate in the publication! It's a fun way to share my love of quilting. You can read about other blocks and designers over on the Quilty Pleasures blog. The blog hop is going strong, and there's magazines to be won! Skedaddle on over check it out! As always your block is adorable. Love this block! Love the combination of piecing and applique....and those sweet fabrics! Cute block. Congrats on being included in the magazine again. They know a good thing when they see it.